Here is your necessary reminder that Kansas Secretary of State Kris Kobach, patron saint of racist voter ID laws, is bad. Kobach could barely contain his glee after the Trump Administration announced on Tuesday that it would be rescinding DACA, a move that threatens around 800,000 people who have known no other home than America with deportation. Remember that Kobach isn’t a rogue voice on TV; he is the guy helping lead Trump’s shadowy Presidential Advisory Commission on Election Integrity, an effort to collect sensitive voter data that is likely tied to Trump’s bogus claim that millions of undocumented immigrants voted illegally in the election. Kobach has also been the biggest supporter of Trump’s baseless voter fraud claim and, as an advisor, recommended the “extreme vetting” of Muslims to Trump during his presidential campaign. 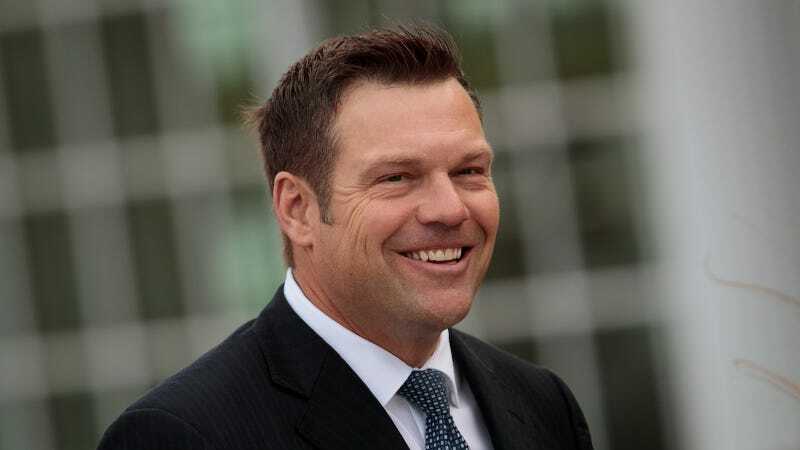 Kobach is also the architect of a host of anti-immigration and voter ID laws around the country, most notably Arizona’s SB 1070, which enabled police officers to demand identification of people they suspected to be here illegally. He also helped train the discriminatory officers of former Arizona Sheriff Joe Arpaio, a racist, criminally negligent megalomaniac who was pardoned by Donald Trump. In Kansas, where he introduced sweeping voter ID laws, he was nearly held in contempt of court for failing to add 18,000 voters to rolls. Though Congress will ultimately determine the fate of DACA recipients in the months to come, federal agencies have sensitive personal information about nearly one million undocumented immigrants. And Kobach, who has been consistently anti-immigration throughout his career, now has the backing of the federal government.